Directions: (Exit 175) From Highway 166 at its junction with U.S. 101 near Santa Maria, drive east about 26 miles to Sierra Madre Road and Miranda Pine Mountain. This road off 166 is opposite the Rock Front Ranch on the north side of the highway (San Luis Obispo County). The road to Miranda Pine Campground is unpaved but generally passable except after spring rains. Low clearance vehicles should avoid this drive, however. *Note- A Los Padres National Forest Adventure Pass is required to park a vehicle on forest roads and must be obtained prior to entering. Directions: (Exit 175) From Highway 166 at its junction with U.S. 101 near Santa Maria, drive east about 40 miles to Cottonwood Canyon Road on the right. Continue south on Cottonwood Canyon Road, turning right (west) on Foothill Rd. following the sign to White Oaks Station and Bates Canyon Campground. Bates Camp is about a 10-mile drive south from 166. Beyond Bates Camp the road is unpaved but it is possible to drive to the top and along the Sierra Madre Mountains east to McPherson Peak (5749’), although low clearance vehicles should avoid the road beyond Bates campground. *Note- A Los Padres National Forest Adventure Pass is required to park a vehicle on forest roads and must be obtained prior to entering. Rewards: Raptors inhabit the lower elevations of Cottonwood Canyon and include Red-tailed Hawk, Northern Harrier, American Kestrel and Golden Eagle. Magpies are often present around the wash and rangeland in the bottom of the canyon. Continue driving into the oak forest and look for nuthatches, bluebirds, titmice and wrens in spring and summer. At the fork in the road, as the sign reads, head left to White Oaks Station and into Bates Canyon and campground. Look for Phainopepla, Bullock’s Oriole and Purple Finch among other oak forest birds. The cool, shaded, northern edge of the Sierra Madre Mountains is home to nesting Cassin's Vireo, and occasionally Northern Pygmy-Owl and Spotted Owl. However, a devastating fire burned much of the area down to Bates Camp, but the habitat is growing back. Spring migrants often move along this transverse ridge so the birding can be prolific in April and May. A view from the ridge top is a spectacular sight! Although exceedingly rare, this is California Condor country. Condors have been released from Lion Canyon located southeast of Cottonwood Canyon near New Cuyama. Directions: (Exit 175) From Highway 166 at its junction with U.S. 101 near Santa Maria, drive east about 56 miles to the town of New Cuyama. Birding along the immediate highway is not considered safe due to traffic, but there are a few places to pull off the road. You should consider doing so only where there are wide shoulders to pull your vehicle completely off the highway. Several roads that can be taken off Highway 166 near the town of New Cuyama. You can pull off the highway along Wasioja Road and Aliso Park Road between 2 and 5 miles west of town. The agriculture fields south and east of town off Bell Road are good for winter birding. Directions: (Exit 175) From the north, take Highway 166 at its junction with U.S. 101 near Santa Maria about 56 miles east to just beyond the town of New Cuyama. Turn right (south) from 166 at either Bell Road (2 miles east of town) or Kirschenmann Road (5 miles east of town). Drive south to Foothill Road. Turn left (east) and drive to the entrance of Santa Barbara Canyon. From the south, take Highway 33 from the town of Ojai in Ventura County and drive north about 60 miles to its junction with Highway 166. Turn left (west) and drive about 4.5 miles to Kirschenmann Road. Beyond the creek crossing the road is not paved. 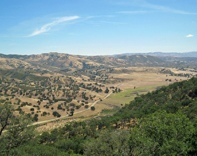 A four-wheel drive vehicle is necessary to continue into the Los Padres National Forest several miles up Santa Barbara Canyon. *Note- A Los Padres National Forest Adventure Pass is required to park a vehicle on forest roads and must be obtained prior to entering. Rewards: At the lower elevations the habitat is primarily grassland and is a good spot for wintering Mountain Bluebirds. 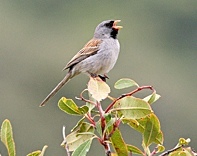 Lower Santa Barbara Canyon’s desert-like scrub and pinyon-juniper woodland is home to a variety of interesting birds. Spring and early summer is best when birds are singing and migrants move through. 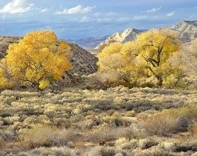 Listen for Scott’s Oriole in the junipers in the hills, and sparrows in the scrub along the road. If your vehicle is so equipped and the gate is open, you can continue to the higher elevations along the jeep trail to Dry Canyon and Tinta Creek. The habitat eventually changes to pine and fir forest where the elevation reaches 5000’. In “invasion” years, Pinyon Jays have been seen.